When I turned in last evening, the Twins had a 12-3 lead over the Oakland Athletics in the bottom of the third inning. At that time, I checked the box score and saw that Twins starting pitcher Nick Blackburn had allowed three runs on eight hits in just two-plus innings. I remember thinking that it was no sure thing that the Twins could hang on to the big lead because it appeared the A’s too were wearing their hitting shoes. Sadly, I was right. Oakland rallied to a 14-13 win. I’m going to be real curious to see how the Twins bounce back this evening. At this point in his young major league career, tonight’s starting pitcher Anthony Swarzak will be making the biggest start of his life. 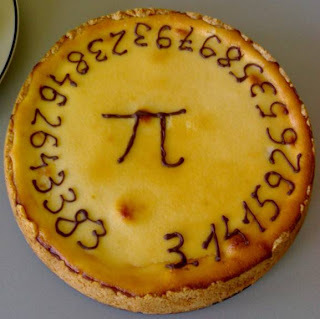 This is about as low budget as it gets. A Plymouth man hired to care for a vulnerable adult admitted to using the man's debit card to pay his own bills, according to police. Hennepin County prosecutors charged Varfee Pappe Dauphine, 30, with financial exploitation of a vulnerable adult and financial transaction card fraud. Both counts are felonies. According to a criminal complaint, Dauphine worked as a personal care assistant to a 38-year-old man identified as MS. MS is confined to a wheelchair because of cerebral palsy and can only speak through a keyboard translator. “MS” is Michael Stephenson, a gentleman whom I actually know a little bit since he attends the same church as my wife and me. Despite very limited physical abilities, Mike’s unconditional joy and peace in the presence of the Lord is so very apparent. Given Mike’s limitations, he sometimes wondered where he could find a place to serve God’s kingdom. But Mike’s gift to others is simply showing up. While people are sometimes frazzled when walking into the house of the Lord on Sundays (whether it’s due to waking up late or dealing with fussy children) they can quickly regain perspective upon seeing Mike walk on his knees to the altar and joyfully worshipping God. In that, Mike’s gift is obvious: He’s serves God’s kingdom by letting people know how truly blessed their lives are and how the trivial aspects are just that….trivial. As you can probably surmise, I take this story is a little more personal than others of a similar nature. I concur that it’s pretty appalling on its face when you hear of someone being robbed. But for me, it’s positively heart breaking (and at the same time infuriating) when it happens to a vulnerable human being who focuses so little on what ails him. ...I beg Sid Hartman to never do TV again. His grasp of names and basic facts has totally eluded him. The long time Star Tribune columnist, who will be 90 next year, appears every Sunday evening on the local CW program The Sports Show. Anyhow, Sid insists Billy Martin never managed the New York Yankees again after Martin was fired from the Oakland A's after the 1982 season. As John Adams once said, "Facts are stubborn things." The fact is, Martin had three different tenures with the Yankees after 1982. With Friday evening's 6-4 win over the Chicago White Sox, the Twins are still a mediocre 3-4 on this final homestand prior to the All Star Break. I realize that a rough patch of games can't be attributed to one player. But veteran outfielder Michael Cuddyer has stood out these past seven games and not in a good way. His lackluster .241 average tells only part of the story. Last Friday vs. Tigers: With the score tied 7-7 in the bottom of the 11th inning, Cuddyer had two strikes on him with the bases loaded and two outs. He ended up striking out on a pitch in the left handed hitter's batters box. Twins would lose 11-9 in sixteen innings. Wednesday vs. Yankees: Trailing 4-2 with the bases loaded and two outs in the fifth inning, Cuddyer struck out on a pitch almost a foot in front of home plate. Twins lose, 4-3. Friday vs. White Sox: With a 4-0 first inning lead and no outs, Jason Kubel was at third base and Cuddy at first. With a golden opportunity to knock out Sox starting pitcher John Danks, Cuddyer is inexplicably picked off first base, stunting the Twins' opening inning momentum. However, Cuddyer would redeem himself with a great leaping catch against the right field wall with runners at second at third. Even though the Sox tied the game on that fly ball, the go ahead run would be stranded at third base. Let's hope that catch allows Cuddy's play to take a turn for the good in what has thus far been a moribund homestand. What happened to Bob Davis? A little over three months ago, I posted the announcement that AM 1500 KSTP fired conservative talk show host Bob Davis. Since that time, my blog has received several hits under the search "What happened to Bob Davis?" I was excited to learn that Bob is now taking advantage of the "new media" via podcasting. This was pointed out to me by ESPN's Bill "The Sports Guy" Simmons. 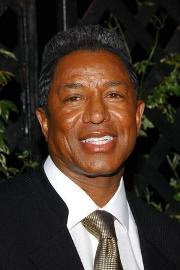 Singer Jermaine Jackson (left) is Michael Jackson's older brother. 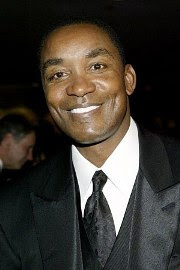 Isiah Thomas is an NBA Hall of Famer. 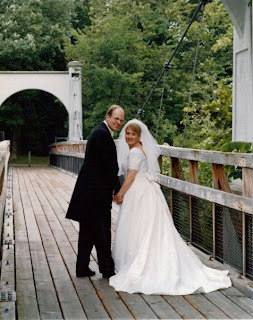 It was nine years ago today when the gal and I said our "I Dos"!!! Every year has gotten better. And of course, the best is yet to come! Happy Anniversary to my one and only!! Would it be permissible for the Nashville P.D. to complete the homicide investigation in the Steve McNair case before you begin the standard demagogue about gun control? Oh, and if you could also hold off the standard frothing-at-the-mouth reactions until McNair's family has a chance to lay him to rest, that too would be awful big of ya!! While waiting to be seated at a restaurant Friday evening, the gal and I ran into a couple we knew from church. Since we were a few blocks from the Metrodome and I was donning my Twins jersey, the gentleman surmised we were going the baseball game that evening. Inevitably the conversation turned to Target Field, the Twins' new outdoor stadium slated to open next season. Ted frowned when the subject was broached: "Yeah, I don't know what to think about the new stadium. I mean, it's pretty cold in April. Why didn't they put a roof on it?" This has become perhaps the most tireless, inane meme I've heard and continue to hear. Let me ask this? In the month of April, does it ever get cold in Chicago? How about Detroit? Cleveland, too? Have the White Sox, Tigers or Indians suffered season-long damage due to playing in cold weather? To me, it will be worth enduring temperatures in the high 30s and/or snow flurries in April to be watching a Sunday afternoon game in June with temps in the 70s, bright sun and a fresh breeze!! I also get a lot of this: "What about people who come all the way from Iowa or North & South Dakota for a weekend game only to have it rained out?? That's not fair!!!!!" (Sigh) These same people must vote Democrat. So you're telling we must live our entire freaking lives without any risk whatsoever? In the event a game is postponed due to rain, there are things called "rain checks". That means you can use that ticket to attend the make up game. If you can't attend the make up game, guess what? YOU GET YOUR FRIGGIN' MONEY BACK!!! So for those who utter those complaints, have at it. I'll be thinking of you in June 2010 when I'm sitting in my seats in the left field bleachers!! Mike Jungbauer to run for MN Governor!!! My State Senator, Mike Jungbauer (R-East Bethel), announced he is running for Governor of Minnesota....via Facebook!!! I said all my FB friends would know first! I am officially announcing my run for governor of the great state of Minnesota! I've heard rumors of the likes of Laura Brod, Marty Seifert and Pat Anderson vying for the GOP nomination. However, I had been hesitant to throw my weight behind any particular candidate. Thank you, my friends, for your support. Today I am announcing my official candidacy for Governor of the great state of Minnesota. I think Minnesotans are ready for an “outside the box” leader with fresh ideas and approaches, and no longer are looking for “old school” legacy politicians. I believe I am that man! The Republican field is crowded, I know that; but all I have seen so far is a popularity contest. I may not be the prettiest or the most recognizable, but I am the most knowledgeable on the issues facing the citizens of this state. Let’s face it, in Minnesota we like divided government. Minnesota also has a rich tradition of bi-partisanship and as all of us have seen in the past few years, that is non-existent. There are many important issues facing our state and country, most notably, high unemployment, declining state revenues and an increased burden on government services. Minnesota is not an exception to the rule – nearly every state in the union is facing similar challenges – some more dire and some more favorable. My voting record shows that I am a conservative Republican, but I also have a track record of bi-partisanship.The type of bi-partisanship I speak of is not giving in or giving up but rather in finding a way to bring both sides together in a win-win conclusion. When the 35W bridge collapsed – I was the only Republican in the legislature willing to participate in an independent, publicly funded, investigation into why the bridge fell. I encouraged my fellow Republicans to participate, but they were unwilling – labeling it a witch hunt. I was at nearly every event in the city of Minneapolis dealing with the collapse and public input on the new bridge. Most times I was the lone Republican. As I attend many events around the state that concern us all, I find myself as the lone Republican. It is said “The world is run by those who show up”, and I show up! The issues – when speaking with constituents one thing is repeated time and time again; jobs, jobs, jobs. While the unemployment rate nears 10% the question we have to ask ourselves is what role should government play in job creation? Free market proponents would argue that the government should just get out of the way and let business do what it does best. I agree the free market is the sure avenue for economic growth and recover, but government must provide a business and tax friendly climate in order for that to occur……I have a tax plan that will accomplish that! Energy – I would argue that energy and environmental policy are the great issues of our time. As we witness congress proceed with the Markey/Waxman cap-and-trade bill, arguably the largest tax increase ever imposed on the citizens of this country, Minnesotans need someone who has a very clear understanding of energy and environmental policy and I am the most studied legislator on these important issues. Everyone is aware that we are nearing an energy transformation; however, this must be achieved through a strong working relationship between the legislature, business community and higher education institutions. Having served on a variety of committees dealing with energy issues, I have concluded that we are taking the wrong approach; trying to achieve a renewable energy transformation through government mandates and costly subsidization programs is not the answer. Once again, government does have a role in this transformation, but it should be done primarily through the free market with aid from the government via tax incentives and a friendly business climate…..I have a plan that accomplishes just that! Priorities – The Minnesota State constitution states that the legislature’s duty is to fully fund education, transportation and public safety. Once we have met those requirements then we can look at all other areas of government. Misplaced priorities is a chronic problem in the legislature and as governor, I will make those priorities a staple of my administration. I take this step extremely seriously! I have a team of advisors that fill in the knowledge gaps I do not myself possess. I believe we need to elevate the conversation now to real issues of the day. Minnesota: Let’s get to know each other! Say, wasn't it revealed that Paul Wellstone also eschewed paying workers' compensation insurance for his employees, a la Franken? Wellstone as Senator Franken's model? It all makes sense now!